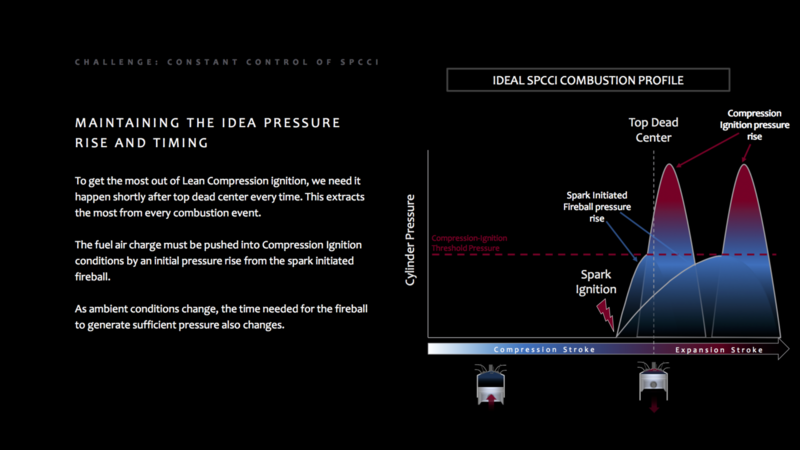 It’s called Spark Controlled Compression Ignition, and Mazda made it work. IRVINE, Calif.—Despite rumors to the contrary, the internal combustion engine is far from dead. Recently we’ve seen several technological advances that will significantly boost the efficiency of gasoline-powered engines. 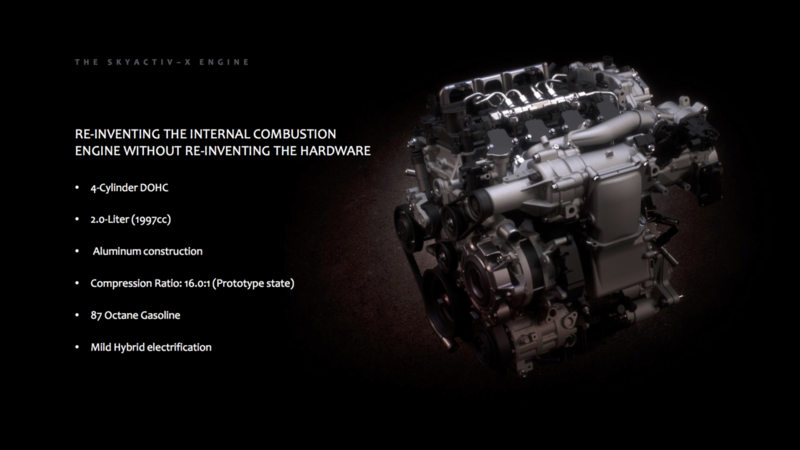 One of these, first reported back in August 2017, is Mazda’s breakthrough with compression ignition. On Tuesday, Mazda invited us to its R&D facility in California to learn more about this clever new Skyactiv-X engine, but more importantly we actually got to drive it on the road. What’s so special about this engine then? 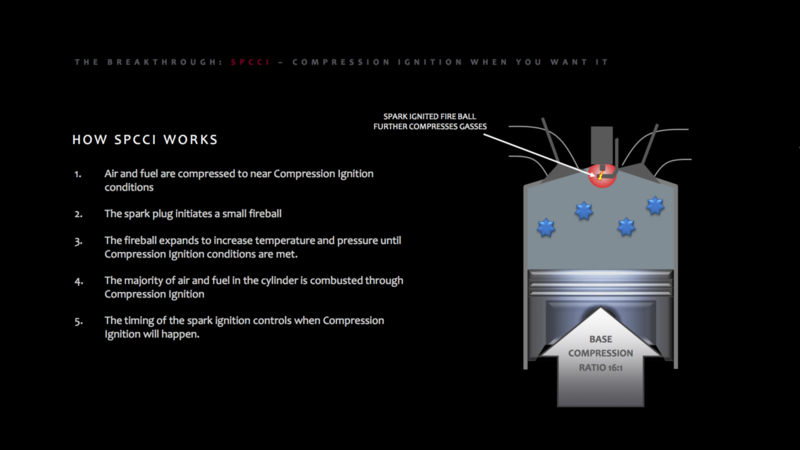 The idea behind Skyactiv-X is to be able to run the engine with as lean a fuel-air mixture (known as λ) as possible. Because very lean combustion is cooler than a stoichiometric reaction (where λ=1 and there is exactly enough air to completely burn each molecule of fuel but no more), less energy is wasted as heat. What’s more, the exhaust gases contain fewer nasty nitrogen oxides, and the unused air gets put to work. It absorbs the combustion heat and then expands and pushes down on the piston. The result is a cleaner, more efficient, and more powerful engine. And Skyactiv-X uses a very lean mix: a λ up to 2.5. That sounds like an automotive holy grail, so you might be wondering why everyone isn’t doing it. As is so often the case, the real world isn’t quite so simple. The problem with very lean air/fuel mixtures is that their combustion isn’t particularly stable; because the fuel molecules are so much less concentrated, it’s easy for the combustion event to fizzle out. The solution, then, is to compress things to a much greater extent than normal. And if you compress the fuel and air enough, a wonderful thing happens: it ignites without the need for a spark. This is known as homogeneous charge compression ignition, or HCCI, an idea that Kyle Niemeyer covered in depth for us back in 2012. HCCI has some other advantages, too. On top of burning cooler and with fewer pollutants, the combustion event happens faster, with a higher pressure peak, so you get more work out of the same energy. All of that sounds pretty wonderful, so you’re probably asking yourself why every gasoline engine on the road doesn’t just use HCCI. Unfortunately, it has been one of those ideas that worked in the lab but couldn’t ever quite be translated into a production engine. The biggest problem has always been controlling exactly when during the engine cycle compression ignition occurred, something that you want as close to top-dead center as possible. HCCI, but with a spark plug? Mazda’s breakthrough was in realizing that the spark plug could still have a role. The Skyactiv-X engine has been designed to have a very high compression ratio—16:1 in fact—and to use a very lean air:fuel ratio, but both of these are just below the threshold needed for HCCI to occur. 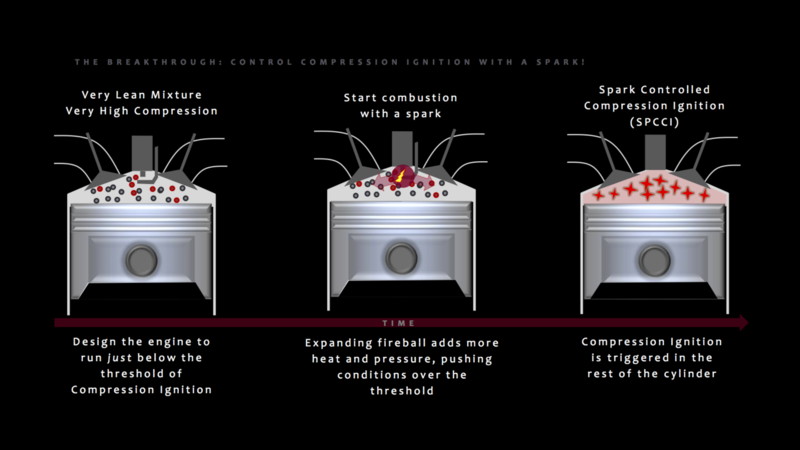 Instead, Mazda’s engine uses a spark to get the party started; the resulting fireball then adds more heat and pressure to the combustion chamber, et voila! Compression ignition has been triggered. 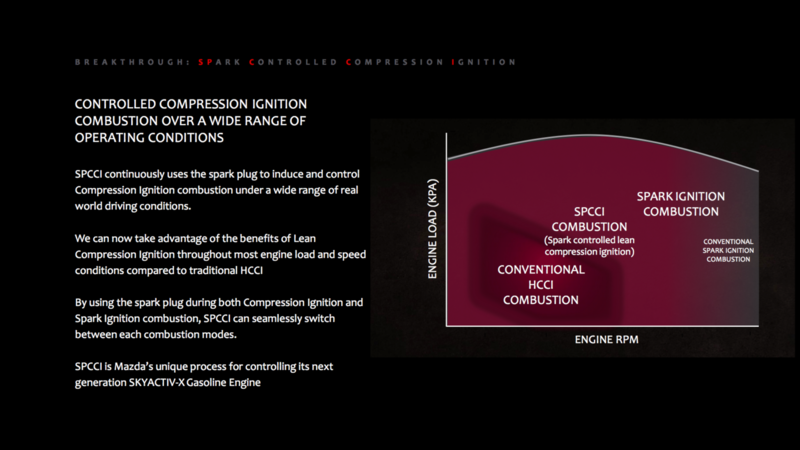 Mazda calls this Spark Controlled Compression Ignition, or SPCCI. Obviously, this wasn’t without challenges. 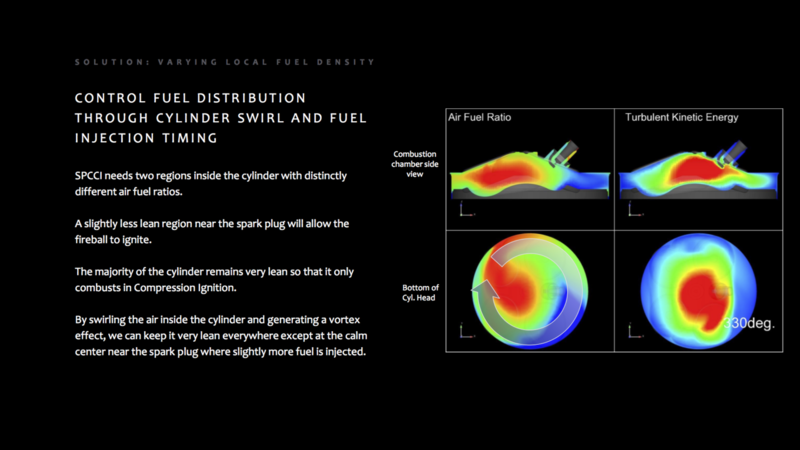 The fuel:air mix needs to be a little richer near the spark for it to ignite than you want it to be throughout the rest of the cylinder. These need to be distinct regions to avoid λ dropping to 2 or below (which won’t undergo compression ignition). That’s achieved by swirling the air inside the cylinder and generating a vortex effect, where the calm center has a low enough λ to ignite by spark, surrounded by a high λ region that then undergoes compression ignition. Mazda’s next challenge was to prevent pre-ignition, or knock. Higher compression ratios increase the potential for knock, which is why higher compression ratio engines usually also require more expensive, higher octane fuel that is knock-resistant. 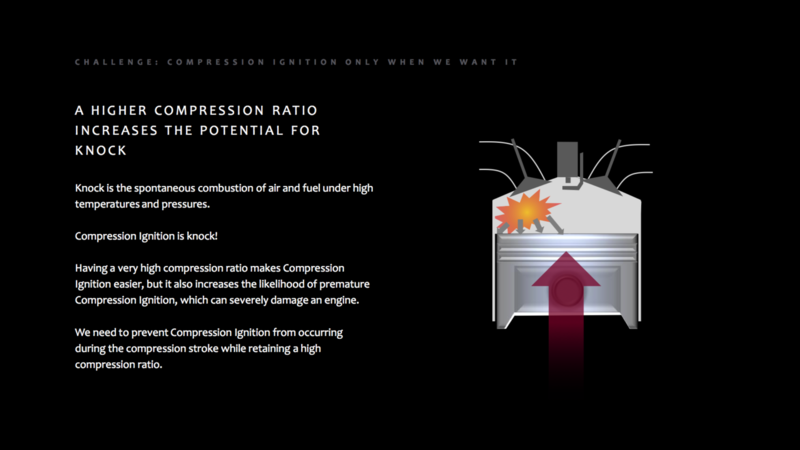 Now, technically, compression ignition isknock, but if it occurs before you want it to—at top dead center—bad things can happen, because a combustion event will exert downward pressure on the piston as it’s moving up on a compression stroke. The solution here was to use less time to heat the fuel:air mix. 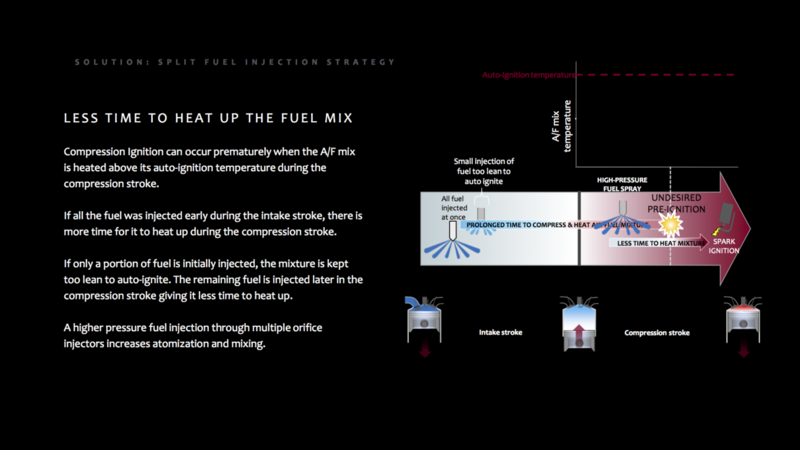 There’s a small initial injection of fuel at first, then the bulk of the fuel is introduced into the cylinder as late as possible during the compression stroke. This is done using multiple orifice injectors to increase atomization and mixing of fuel and air. If all that wasn’t enough, there’s the added problem of keeping track of compression ignition. In the past, this has been one of the hardest problems for HCCI engines to solve. 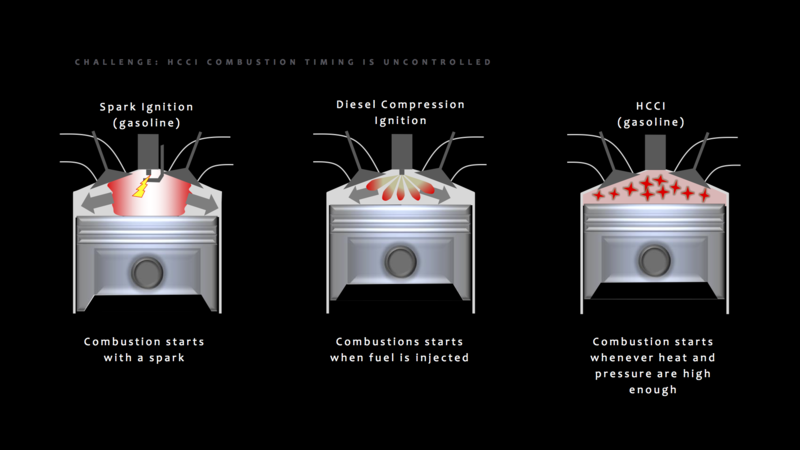 Ideally you want combustion to happen at the same point in the engine cycle each time—about four degrees after top dead center. But as ambient conditions change—a cold day in Denver versus a hot one in Houston—the time needed for the fireball to reach sufficient pressure also changes. 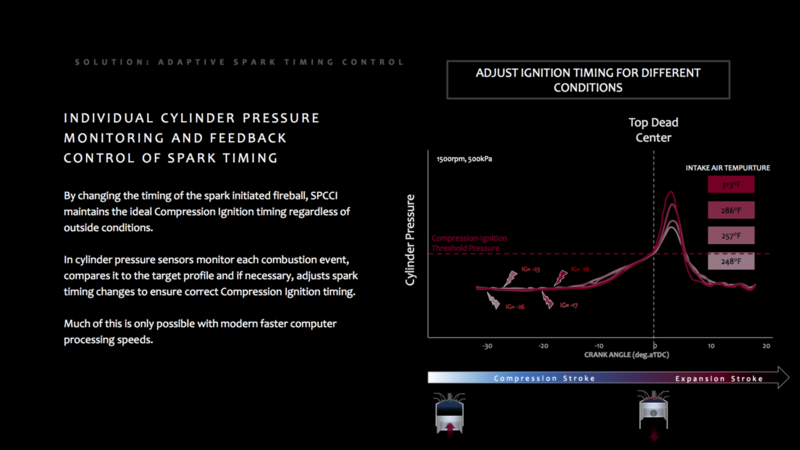 So the engine ought to be able to change spark timing to keep the peak pressure at the right spot. Skyactiv-X has some other features that differentiate it from Mazda’s current Skyactiv-G engine family. It has a higher-pressure direct-injection fuel system to promote atomization that runs somewhere between a current gasoline direct injection system and a diesel DI system, although I wasn’t able to get a specific fuel pressure figure. There are in-cylinder pressure sensors, which are necessary to feed the engine’s digital brains the data it needs to control timing. There’s a low-boost Roots-type supercharger of sorts—Mazda calls this a high response air supply, as its job isn’t to add power, and it only really contributes under high loads. There’s also an air-to-water intercooler, an exhaust gas recirculator (EGR) cooler that helps prevent premature combustion, electric variable valve timing actuators (that use stepper motors) for faster valve timing, and, finally, a 48v mild hybrid start-stop system.